WHAT COLOUR IS MY KITTEN? I'm often sent photos asking "what colour is my kitten – I've looked all over the web and he isn't any colour I can find!" Many of those indefinable kitten colours are colours that haven’t fully developed (such as the ghost striping on black kittens) or are due to conditions in the womb before the kitten is born. Kittens are not necessarly born with their adult colour in place. For example, colourpoint kittens are born white and the colour develops over several weeks. This is because colourpointing is temperature dependent and the colour only develops fully on the cooler extremities. This can confuse the unwary as their kittens change pattern! This black kitten had ghost stripes while young; these grew out as the kitten fur moulted and the adult fur grew in. Ghost stripes are common in solid colour kittens, but are not always so visible. 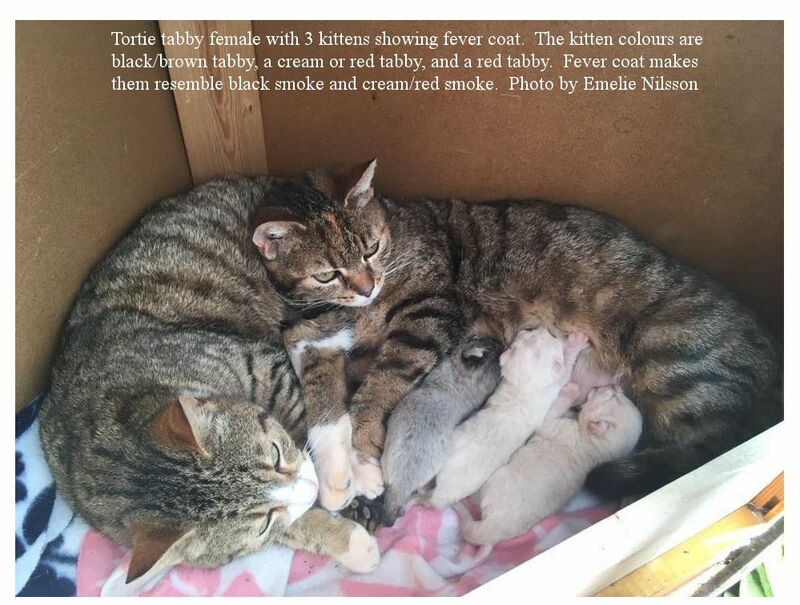 Fever coat usually means that the mother had an infection while pregnant or that she was stressed or on medication (the last condition can happen if the owner doesn’t realise their cat is pregnant). 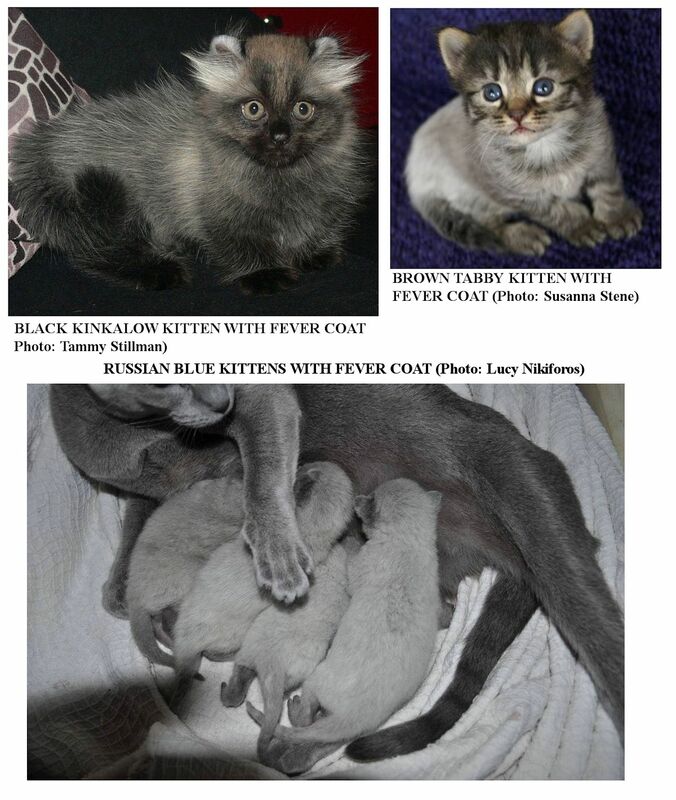 The kittens have the so called “fever coat” when born, but it fades and by the time they are about 6-8 months it has gone completely. Fever coat is means the pigments haven’t been properly deposited in the fur so it can appear silvery-grey, cream or reddish. In extreme cases, black smoke kittens have been born with what appears to be Siamese colouration – a creamy coloured body with black extremities. 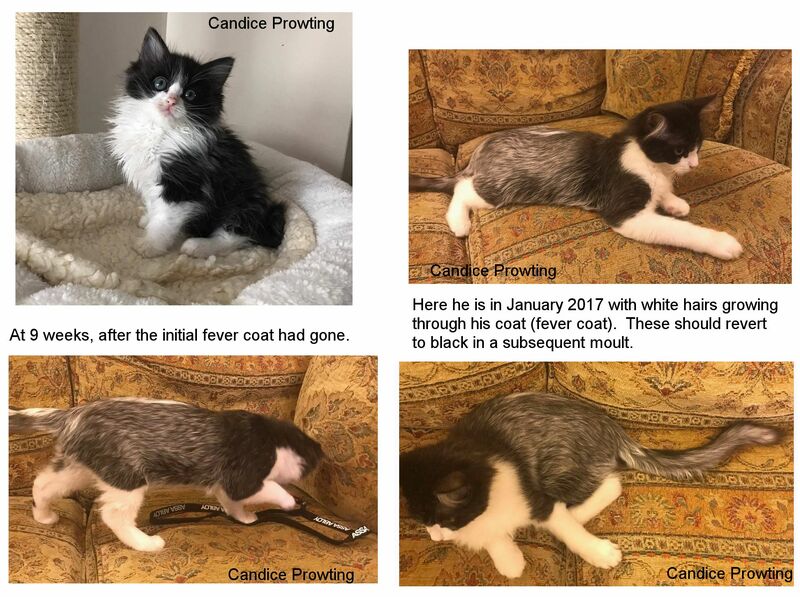 Below is a black kitten with fever coat. As it grew, the silvery and reddish fur grew out and a solid black colour replaced it. In 2017, Candice Prowting sent me some photos of fever coat in a non-pointed Ragdoll, bred by her husband (Soirca Ragdolls). The kitten had slight fever coat as a tiny kitten with white at the roots of the hairs at about 3/4 weeks old. He had his first vaccination at 9 weeks, but the whole litter had a few days where they were a bit quiet and off their food. Except for this kitten, they bounced back, but he was off his food for longer and lost weight, and was eating normally and fit and healthy by the time the 2nd vaccinations were due in December. A little later he sprouted a lot of white hairs, and they were still coming through in January. This appears to be fever coat, perhaps linked to his vaccination reaction. 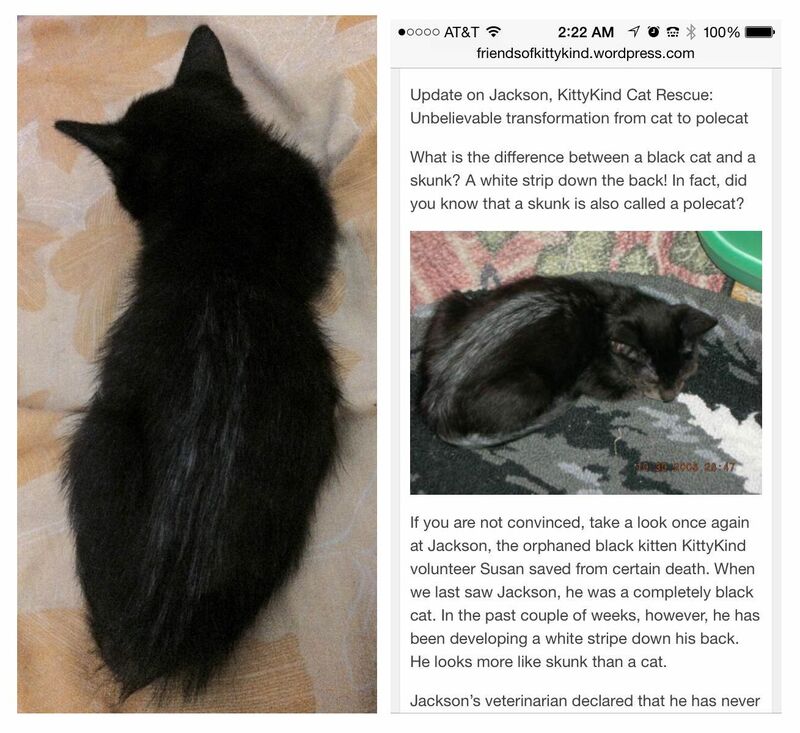 In September 2015, Alaina Hickman, who works with a rescue group in Omaha, NE called Feline Friendz, sent me some photos of a black kitten, Gogo, that started developing parallel white stripes along her back. The stripes were becoming more pronounced as the kitten gets older. 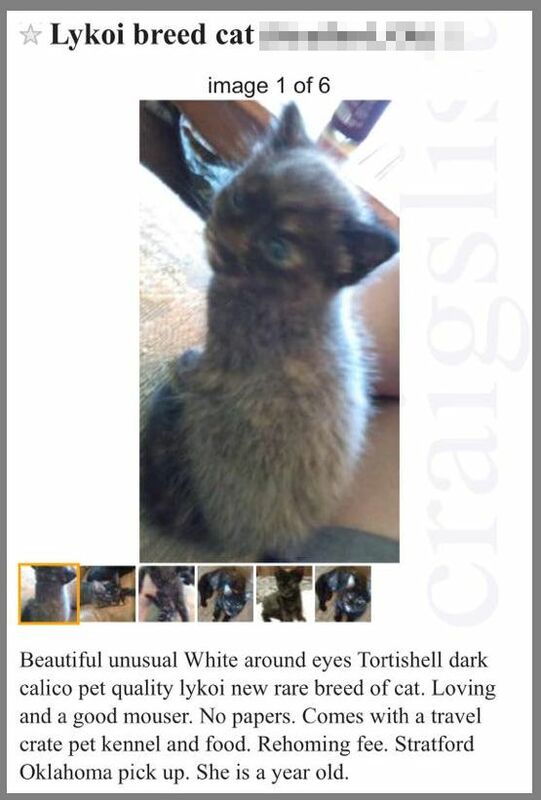 She also found a photo (screen grab shown) of a similar kitten named Jackson. 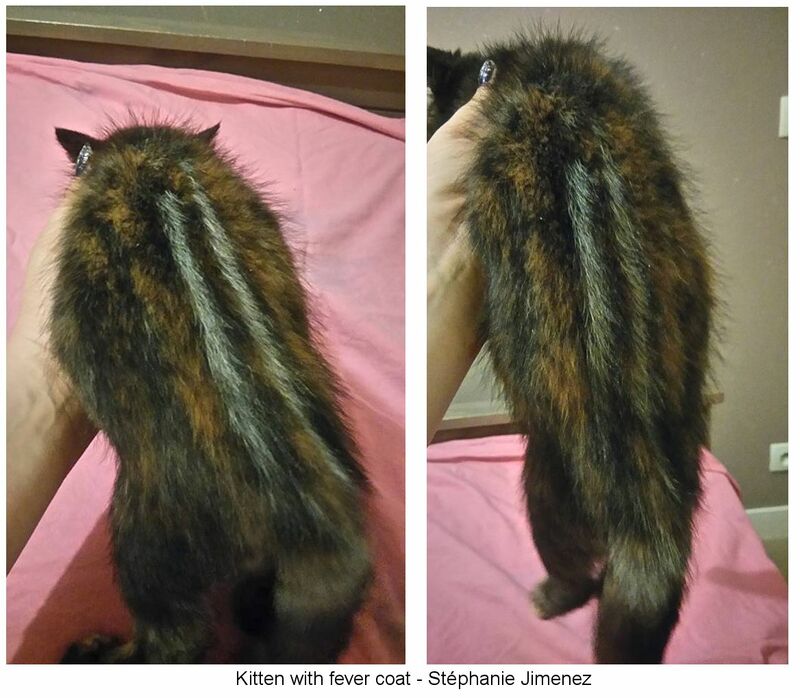 The colour change may be a form of leukotrichia that starts along the back and includes the tail - it is similar to the cat depicted in the Thai manuscript - but is more likely to be "fever coat" which can develop in kittens and vanishes when the coat is moulted and the adult coat grows in. Genetically all cats are tabby (the addition of a double dose of the non-agouti gene turns the coat solid coloured) and you can see that the white has followed what would have been the dorsal stripe in a tabby cat. This is also seen on tabby and tortie kittens where the stripes along the back are greyish or reddish, giving a chipmunk appearance.